U.S. Accuses Russia Of Election Year Cyber-Meddling : The Two-Way The Obama administration says it is confident that Russia is responsible for the hacking of the Democratic National Committee and accuses Moscow of trying to interfere with U.S. elections. 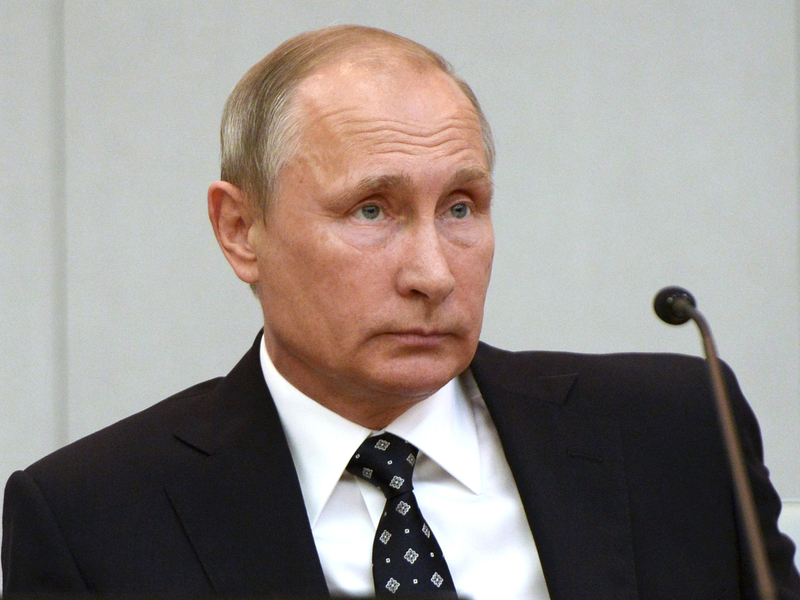 Russian President Vladimir Putin listens during the opening session of the newly elected State Duma, Russia's lower house of parliament, in Moscow. The U.S. blamed the Russian government for the hacking of American political sites and accused Moscow of trying to interfere with the upcoming presidential election. The United States has officially blamed Russia for the hacking of computers of the Democratic National Committee and other political organizations, and it accused Moscow of trying to interfere with this year's election process. The charge came in a strongly worded statement released by the Department of Homeland Security and the Office of the Director of National Intelligence on Friday. "The U.S. intelligence community is confident that the Russian government directed the recent compromises of e-mails from U.S. persons and institutions, including from U.S. political organizations," said the joint statement. The statement said the alleged hacks of emails on sites like DCLeaks.com and WikiLeaks and by the online persona "Guccifer 2.0" all have the earmarks of "Russian-directed efforts." "These thefts and disclosures are intended to interfere with the US election process. Such activity is not new to Moscow—the Russians have used similar tactics and techniques across Europe and Eurasia, for example, to influence public opinion there. We believe, based on the scope and sensitivity of these efforts, that only Russia's senior-most officials could have authorized these activities." The denunciation comes as U.S.-Russia relations have worsened in recent weeks. "This also came on the same day that Secretary of State John Kerry said he thought Russia should be investigated for war crimes after the airstrikes on hospitals in Aleppo , Syria. He said Russia and the Syrian regime are targeting these facilities. That's the key word, because targeting shows intent and that's what leads to a war crimes charge...so it really shows a low point has been reached between Washington and Moscow." The Obama administration has also been under pressure from lawmakers to name and blame Russia for the hacking of the DNC computer system that was first disclosed in June. Sen. Cory Gardner, R-Colo., says he will introduce a bill to sanction "Russia's cybercriminals" in the wake of the Obama administration's accusation. Gardner is the chairman of the Senate Foreign Relations Subcommittee on East Asia, the Pacific, and International Cybersecurity. He said in a statement that his bill would require the administration to investigate those who have undermined cybersecurity "and aggressively pursue sanctions when appropriate." Two California Democratic lawmakers released almost immediate statements applauding the administration. "We should now work with our European allies who have been the victim of similar and even more malicious cyber interference by Russia to develop a concerted response that protects our institutions and deters further meddling. "All of us should be gravely concerned when a foreign power like Russia seeks to undermine our democratic institutions, and we must do everything in our power to guard against it. This is why Senator Feinstein and I have been urging state election officials to take every precaution and to avail themselves of the cyber expertise offered by the Department of Homeland Security." "The administration's acknowledgement that Russian intelligence agencies are attempting to influence the U.S. election and undermine public confidence conveys the seriousness of the threat. Attempted hacking of our election system is intolerable, and it's critical to convince the Russian government to cease these activities. If it does not, we must develop a strong response." The joint intelligence statement also says some states have experienced scanning and probing of their election-related systems, and the officials point a finger at "servers operated by a Russian company." But the intelligence agencies say they can't yet attribute this activity to the Russian government.